Carolyn Drake spoke with The Diplomat about her travels in Central Asia and her new book, Two Rivers . 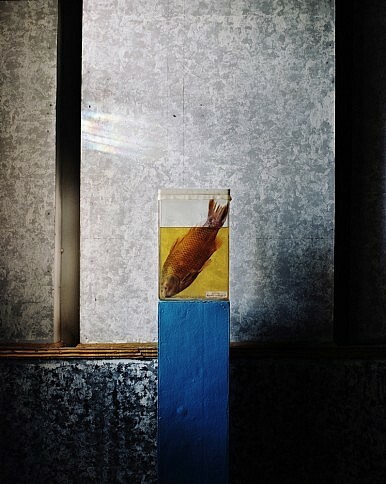 A preserved sea bream is half-submerged in a case that sits on a blue stand at a museum in Aralsk, Kazakhstan, reminding us that the Aral Sea from which it came once teemed with life. Pilgrims are seen taking a dip in between visiting Sufi sights in southern Kazakhstan. A female shaman in Tajikistan conducts a ritual to cure a young woman of fatigue by holding a dagger over her shoulder – a spread of fruits, nuts and bread is set out before them. These images, each gripping and telling a vastly different story come from Two Rivers, the new photographic meditation by award-winning photographer Carolyn Drake. The recipient of a Guggenheim Fellowship, a Fulbright award and a number of international photography awards, Drake’s work has illuminated the pages of National Geographic, The New Yorker, and TIME Magazine. In Two Rivers, self-published with support from a Kickstarter campaign and accompanied by an essay penned by The New Yorker’s Elif Batuman, Drake has taken as her latest subject the remote expanse of the ‘Stans – Turkmenistan, Uzbekistan, Tajikistan, Kazakhstan and Kyrgyzstan. For most of us, this region is little more than an unfathomable blank space that stands between the Middle East and China, bordered by Russia to the north with Iran and Afghanistan to the south. Within the dramatic terrain of this epic landmass lie two rivers as old as the region itself: the Amu Darya and Syr Darya, from which the book’s name is derived. The ancient Greeks knew the rivers as the Oxus and Jaxartes, while an Islam hadith holds that they are two of four rivers that lead directly into Paradise. Unfortunately, it is lucky if they flow at all now. Originating in the mountains near China’s western edge, these once mighty waterways ran to the bountiful Aral Sea – that is, before the region was incorporated into the Soviet Union. The rivers’ flow was then redirected for agriculture and development, which coupled with global warming to all but dry up what remains. Compared with their neighbors, Kazakhstan and Turkmenistan have managed to escape relatively unscathed, thanks to their vast reserves of oil and natural gas. But others within the region have not been so lucky. In Two Rivers, Drake explores the complex realities in an unconventional style “that eschews traditional documentary for an altogether more impressionistic point of view in which mystery and suggestion are as important in evoking a sense of place as straightforward landscapes or portraits,” writes The Guardian, adding a healthy dose of praise for her “rich” and “atmospheric” use of color in the photos. This deft manipulation of color is seen in turquoise doorframes, a freshly killed duck’s plumage, and garish packages used for smuggling heroin; juxtaposed with images of monuments built by megalomaniacal post-Soviet dictators. Drake recently spoke with The Diplomat about the book, her travels in this enigmatic region and the illusory nature of geographical divisions.